Michael Kammen’s new book Digging Up the Dead: A History of Notable American Reburials offer an unconventional take on American cultural history, but who would have thought that in fact there exists an entire magazine devoted to a similar “examination of life through the lens of death?” In any case, we would have never guessed it, if not for this recent review of Kammen’s book in the latest edition of Obit magazine. The review begins: We’re constantly, reflexively, wishing for the dead to “rest in peace.” It’s almost a throwaway line, but also a benediction, meant literally and figuratively. Burial signals the end of life’s journey, life’s struggle—a final repose for the secular, and a way station for those who believe that body and spirit will re-unite in an afterlife. But the finality of burial itself is far from guaranteed. For the famous, the notorious, and sometimes even the obscure, interment may be just the first move in a protracted struggle over ownership, identification, reputation and history. 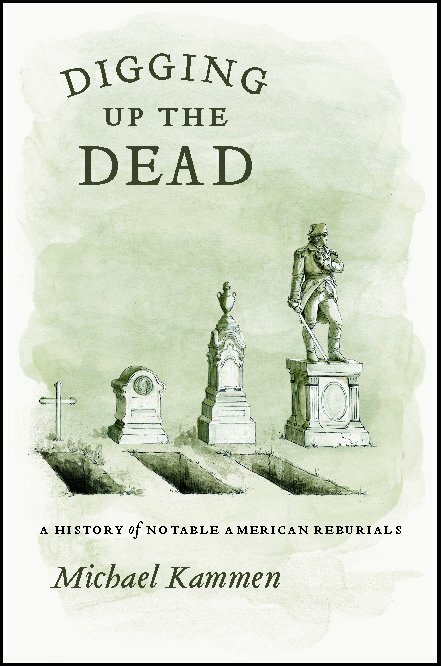 Such contests are the subject of Michael Kammen’s Digging up the Dead: A History of Notable American Reburials, which catalogues the surprisingly peripatetic fate of many of this country’s most illustrious corpses. Read . . . Since 1963, the Press has awarded the annual Gordon J. Laing Prize to the Chicago faculty author, editor, or translator whose book has brought the greatest distinction to the Press’s list. 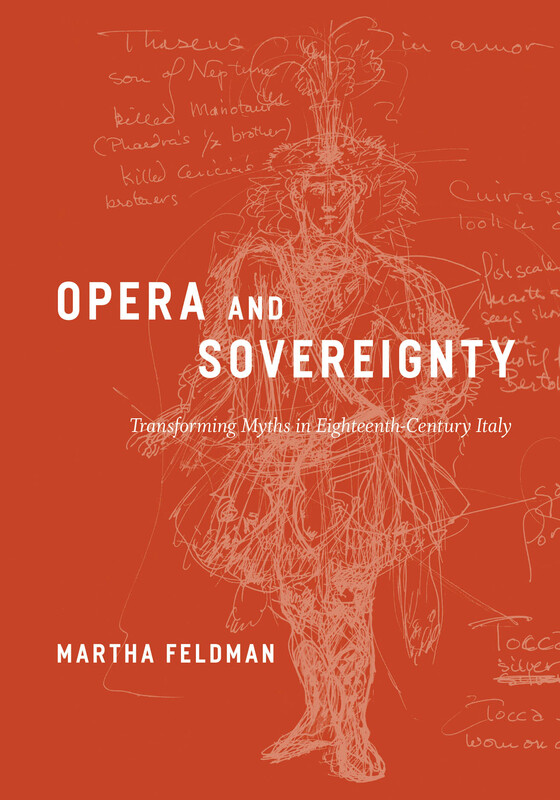 This year, at a ceremony held at the International House on the University of Chicago campus, the prize honored U of C professor of music Martha Feldman for her book Opera and Sovereignty: Transforming Myths in Eighteenth-Century Italy. Performed throughout Europe during the 1700s, Italian heroic opera, or opera seria, was the century’s most significant musical art form, profoundly engaging such figures as Handel, Haydn, and Mozart. Opera and Sovereignty is the first book to address this genre as cultural history, arguing that eighteenth-century opera seria must be understood in light of the period’s social and political upheavals. Taking an anthropological approach to European music that’s as bold as it is unusual, Martha Feldman traces Italian opera’s shift from a mythical assertion of sovereignty, with its festive forms and rituals, to a dramatic vehicle that increasingly questioned absolute ideals. She situates these transformations against the backdrop of eighteenth-century Italian culture to show how opera seria both reflected and affected the struggles of rulers to maintain sovereignty in the face . . .
Death waits for us all, but only those sentenced to death know the day and the hour—and only they can be sure that their last words will be recorded for posterity. This month, the Press will publish Robert K. Elder’s Last Words of the Executed, a compendium of utterances from convicted criminals put to death under the American justice system. The Economist recently reviewed Edler’s book, and noted that “America’s diverse heritage is stamped even onto its killers’ final moments.” The last words are remarkable for their remorse, humour, hatred, resignation, fear and bravado. “I wish you’d hurry up. I want to get to hell in time for dinner,” a 19th-century Wyoming murderer told his hangman. Some rambled; others were concise. Several blamed the drink; others reasserted innocence, or (especially in recent years) railed against the death penalty. Some accepted their fate. “If I was y’all, I would have killed me. You know?” said a Texan, who had murdered his son’s former girlfriend and her sister, as he readied himself for lethal injection. 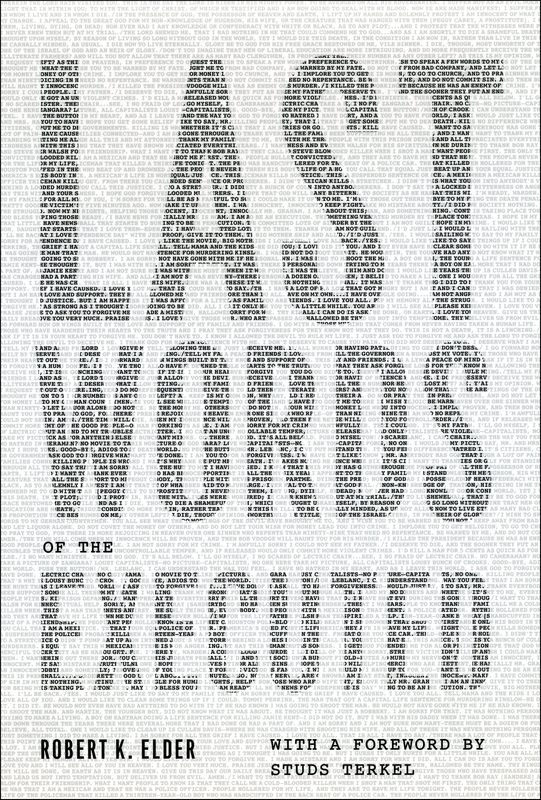 A staunchly apolitical book, Last Words of the Executed asks readers to listen closely to these voices that echo history. The result of seven years of extensive . . . Though Pulitzer Prize-winning historian Michael Kammen’s new book Digging Up the Dead: A History of Notable American Reburials focuses it’s attention on the deceased, his unique approach breathes life into the telling of American history. A recent review in the The Chronicle of Higher Education attaches some lively adjectives to Kammen’s book like peculiar, morbid, and even funny, but as Kammen insists the book “‘ up to more than a miscellaneous lot of bizarre and lurid, but morbid and intensely interesting, anecdotes…’ analyzing reburials helps us see important cultural trends, including the reputations of historical figures.” Taking us to the contested grave sites of such figures as Sitting Bull, John Paul Jones, Frank Lloyd Wright, Daniel Boone, Jefferson Davis, and even Abraham Lincoln, Kammen explores how complicated interactions of regional pride, shifting reputations, and evolving burial practices led to public, often emotional battles over the final resting places of famous figures. Grave-robbing, skull-fondling, cases of mistaken identity, and the financial lures of cemetery tourism all come into play as Kammen delves deeply into this little-known—yet surprisingly persistent—aspect of American history. Simultaneously insightful and interesting, masterly and macabre, Digging Up the Dead reminds us that the stories of American history don’t . . .
Few people writing today could successfully combine an intimate knowledge of Chicago with a poet’s eye, and capture what it’s really like to live in this remarkable city. Embracing a striking variety of human experience—a chance encounter with a veteran on Belmont Avenue, the grimy majesty of the downtown L tracks, domestic violence in a North Side brownstone, the wide-eyed wonder of new arrivals at O’Hare, and much more—these new and selected poems and stories by Reginald Gibbons celebrate the heady mix of elation and despair that is city life. 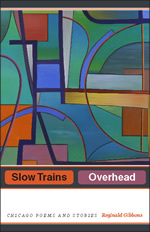 With Slow Trains Overhead, he has rendered a living portrait of Chicago as luminously detailed and powerful as those of Nelson Algren and Carl Sandburg. Gibbons takes the reader from museums and neighborhood life to tense proceedings in Juvenile Court, from comically noir-tinged scenes at a store on Clark Street to midnight immigrants at a gas station on Western Avenue, and from a child’s piggybank to nature in urban spaces. For Gibbons, the city’s people, places, and historical reverberations are a compelling human array of the everyday and the extraordinary, of poverty and beauty, of the experience of being one among many. Penned by one of its most prominent writers, . . . Climate change—and the debate about its causes or validity—is a subject of perpetual interest. Recently, we told you about the chasm between meteorologists—who predict short-term weather patterns and remain skeptical about long-term change—and climatologists—who, as the New York Times reported, “almost universally endorse the view that the earth is warming and that humans have contributed to climate change.” (Stephen Colbert also recently covered in conflict with an amusing “Science Catfight” between Joe Bastardi, a weather forcaster, and Brenda Ekwurzel, of the Union of Concerned Scientists.) 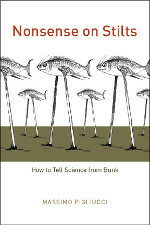 Now the UK’s Independent has offered an overview of books that “separate global warming fact from fiction.” And Massimo Pigliucci’s Nonsense on Stilts: How to Tell Science from Bunk get singled out as “entertaining and valuable guide to sorting the scientific grain from the chaff of pseudoscience.” He makes a distinction that clarifies some of our current problems. There are two kinds of bone fide science: one is law-based and experimental, cut-and-dried as a crystal chalice or a perfect intertwined double helix of DNA. Then there are historical sciences such as evolution or climate research that employ “the methods of a crime detective.” .… As Pigliucci points out, what happened happened, and can be deduced . . . When Edgar Allan Poe died in a Baltimore gutter in 1849, he was buried in an unmarked grave, his funeral attended by only a handful of friends. Within a few decades, however, his growing reputation led to his body being dug up and reburied not once, but twice, in more ostentatious quarters—the second move accompanied by a memorial service attended by such prominent figures as Tennyson and Whitman. And Poe’s bones may not yet be done with their travels: last year’s celebration of his bicentennial brought with it a public tussle between citizens of Baltimore and Philadelphia over each city’s right to call Poe’s legacy—and body—their own. Poe, however, is far from alone: as Pulitzer Prize-winning historian Michael Kammen reveals in Digging Up the Dead, Americans have been fighting over the remains of their heroes since the early days of the Republic. Vividly recounting the restless afterlives of such figures as Sitting Bull, Jefferson Davis, Daniel Boone, Abraham Lincoln, Frank Lloyd Wright, and Mark Rothko, Kammen shows how regional pride, mistaken identities, battles over reputations, and even crassly commercial tourism have all played parts in this impressively grisly obsession with exhumation. From the grotesqueries of grave robbing and skull fondling . . .
Last Saturday’s edition of the Chicago Tribune ran a review of Martin Preib’s The Wagon and Other Stories from the City. With most of its content gleaned from a recent interview with Preib, the review offers some interesting background on the experiences that have inspired his writing, including his work with the Chicago Police Department and in various other capacities within Chicago’s service industry. You can read it read it online at the Printers Row blog (Preib is also scheduled to appear at the Printers Row Lit Fest June 12 and 13). Also, read a story from the book: “Body Bags” and listen to Preib discussing his work on the Chicago Audio Works podcast. . . .
A recent article in the New York Times on the folly of pursuing a PhD in the humanities—a mistake which a few people apparently continue to make—begins: Law students get a diploma in three years. Medical students receive an M.D. in four. But for graduate students in the humanities, it takes, on average, more than nine years to complete a degree. What some of those Ph.D. recipients may not realize is that they could spend another nine years, or more, looking for a tenure-track teaching job at a college or university—without ever finding one. The article goes on to make grad school sound like playing chicken with a black hole, and surely it will be the direct cause of more students jumping ship in hopes of finding safer harbor in the private sector. But does such safe harbor really exist? 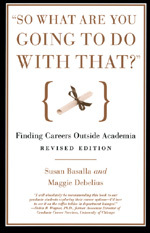 If you can’t hack it in grad school can you really do that much better in the “real world?” In “So What Are You Going to Do with That?”: Finding Careers Outside Academia Susan Basalla and Maggie Debelius—Ph.D.’s themselves—answer all those questions with a resounding “Yes!” A witty, accessible guide full of concrete advice for anyone contemplating the jump from . . . In the latest episode of our podcast, Chicago Audio Works, Chicago Police officer, author, one-time doorman, union organizer, and bouncer Martin Prieb reads from his new book The Wagon and Other Stories from the City and answers a few questions about his work and writing. Inspired by Preib’s daily life as a policeman—as well as his many other experiences working in the Windy City’s service sector—The Wagon offers a view of city life from the vantage point of one of it’s newest most trenchant, and authentic chroniclers. 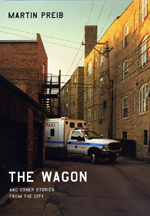 With material that ranges from noir-like reports of police work to streetwise meditations on life and darkly humorous accounts of his other occupations, The Wagon brings the city of Chicago to life in ways that readers will long remember. For more read this review in this week’s issue of the Chicago Reader (scroll down to the bottom of the page), or read a story from the book: “Body Bags.” Hear more readings, interviews, and other features from our authors on Chicago Audio Works. . . .